Review by Deanna Thomas, Liverpool Confidential. It’s not a chore driving from Manchester to Liverpool and I never have to work too hard to persuade my husband, who grew up in Maghull, to return to the Motherland. But while I stood with my back to the Everton shop in Liverpool One, waiting for him to stop checking out tracksuit tops, I looked up and noticed there was a bloody great big garden on the roof. We made our way up there to discover the New World Trading Company has gone and built a huge, two-storey, white, colonial-style restaurant and bar, surrounded by deck chairs and outdoor bench seating. This offshoot of Living Ventures also owns The Botanist, a restaurant brand with a similar menu, which can be found in affluent Cheshire towns and beyond. The Club House opened in February 2016 after the success of its other Liverpool venture, Smuggler’s Cove in Albert Dock. Designers have been generous to their chefs who aren’t forced to work in the usual windowless, hot box. Food is cooked outside, in a purpose-built hut, where chefs blink in wonder like ex-battery hens, allowed to see daylight and feel fresh air on their skin during their shift. 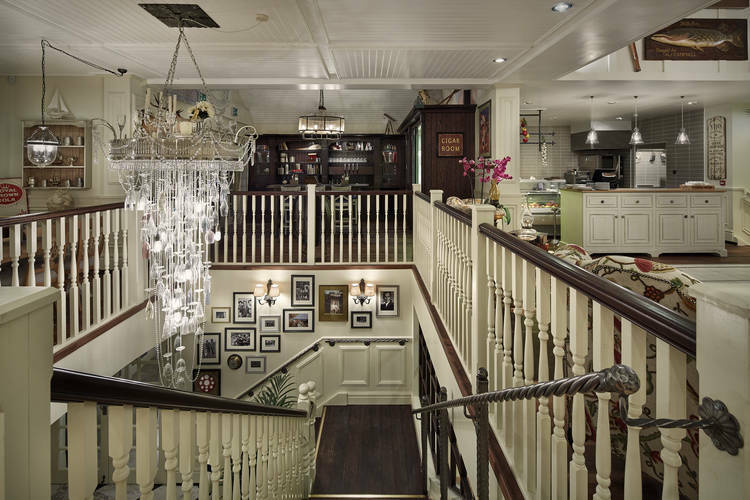 Inside, the restaurant and bar have the cool, romantic style of an affluent international port in a bygone era. Slightly contrived touches like stuffed crocodiles hang from the wall and a giant chandelier, made from more than 60 wine glasses, hints at British eccentricity. “Antiques” have a new, but old, but really new look to them, like on a stage set. Once you’ve been to more than two of the group sites, as I have, you pretty much know the menu off by heart, but this isn’t necessarily a bad thing. New World has a formula that works, although their quirkiness can be overdone in parts. Some of the serving style has been infantilised, so burgers come on wooden trays and various things arrive in “treasure chests”. Children love this sort of thing, but I suspect adults only tolerate it. We chose a couple of starters to share: Pork crackling with chilli, spring onion and sweet apple sauce (£3.50) as well as a chest of wings served with piri piri sauce (£5.95). The cracking (main pic) was crispy and not greasy, scattered with spring onions and sliced red chilli. My daughter questioned why some had little hairs sprouting from them, but when I explained that it was baked shards of pig skin, she just shrugged and popped a few more in her mouth. That’s my girl. The chicken wings had been tossed in the same spice mix as the crackling and weren’t greasy either. The chilli sauce on the side was homemade and very good, but tasted like they’d made it using fruity scotch bonnet chillies. You can’t just match any hot pepper sauce to chicken and call it ‘piri piri’, but childhood holidays in Portugal have made me a piri piri pendant. I’ll get over it. The boy wanted a hanging kebab (chicken £11.50). You’d only have to be here a few minutes before spotting one of these swinging about. They come with a pot of melted garlic butter on top which you pour down a little hole, soaking the kebab and landing in a bowl of chips underneath. Much like my ideal spa experience. The girl went freestyle, creating her own deli board – £9.95 for four items chosen from a list of picnic options. Scouse Spouse fancied a burger (£10.50) so chose lamb with added blue cheese (+£1.25) It was fine, but needed salt. I thought I’d challenge them with a bit of proper cooking so chose sea bass genericus, the go-to fish dish of choice for chefs. “Pan-fried sea bass fillets with spinach, tomato and (there it is again) piri piri dressing”(£13.95) was all very polite but lacking in carbs or oomph or something to make it a completely satisfying meal. I pimped it up with a side of decent white cabbage coleslaw (£2.50). The food here is ok, in an unchallenging, people-pleasing way and both times we visited the place filled up very quickly. The well stocked bar has hundreds of spirit options; there’s an extensive mid-priced wine list and a wide range of bottled beers and craft ales. In summer when you’ve got a day to yourself and are in the mood for meeting friends, drinking and grazing on some decent scran to help soak it up, there are not going to be many better places to head for in the park.